An environmental impact report on the future of the Sani Pass is to be handed to the government shortly amid complaints that a proposed tarred road would destroy the sense of adventure for tourists visiting one of the KwaZulu-Natal’s most scenic mountain passes. The proposed upgrade involves building a new 19km tarred or concrete road to replace the winding gravel road to the summit of the Sani Pass in the southern Ukhahlamba-Drakensberg. A final environmental impact assessment (EIA) report by Gibb consultants, sent to stakeholders last week, suggests there are no fatal flaws to the proposal and recommends that it be approved by the national Department of Environmental Affairs. 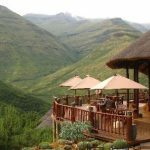 However, a social impact report by the Institute of Natural Resources recognises that tour operators who run 4×4 adventure trips to Sani Pass and several tour lodges could be hard hit. The report says that 75 percent of the regional and international tourism operators and agents surveyed on the proposal indicated that they would remove the Sani Pass and Southern Drakensberg from their itineraries if a tarred or concrete road was built. Russell and Simone Suchet, representing tour operators in the Southern Drakensberg area, argued that the Outeniqua Pass between George and Oudtshoorn was one of the most scenic tarred routes in the country, but very few people travelled along this route specifically for the scenery or wilderness experience. Yet the nearby Swartberg untarred pass between Oudtshoorn and Prince Albert remained a major tourist and wilderness attraction. The Wildlife and Environment Society (Wessa) also voiced fears that replacing the Sani Pass gravel road would erode the wilderness experience for visitors. The society said the plan appeared to be a “classic case of someone in an office drawing lines on a map and making a decision without having any idea of the situation on the ground”. Merely adding tar to a road did not magically produce tourists, it argued. One of the few letters to the consultants indicating support for an upgraded route up Sani Pass came from Jonathan Aldous, owner of the Sani Top Chalet. 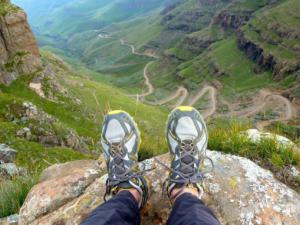 Aldous said he recognised that the Sani Pass was a popular 4×4 adventure route, but it made little sense to keep repairing a gravel road that was frequently eroded by rain. “Don’t let greedy tour operators and old sentimentalists cloud your decisions. We will all survive, whatever happens, because there are plenty of opportunities out there. Fix the road!” he told the consultants in an e-mail. According to the EIA report, about 13 500 Basotho a year travel into South Africa through the Sani Pass border post, compared with about 25 000 South Africans who travel up the pass, about 90 percent of whom were tourists. The report says that the route is an important business route and link for people living across the border in Lesotho. Gibb consultants conclude that a tarred road could open up the eastern Lesotho region to tourism development and strengthen trade links between KZN and Lesotho. * The deadline for public comment is November 25. For more information, e-mail: |Sani-phase2-EIA@gibb.co.za or contact Gisela Fechter at 031-267 8500 .